98% of the children 3-5 years old, scored at the genius level. 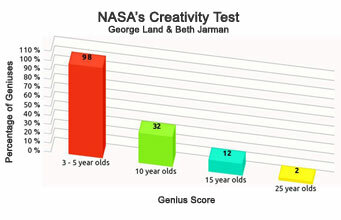 Only 32% of the same children at age 12 scored at the genius level, and this dropped to 12% at age 15. Finally, the researchers gave the same test to 1 million adults, aged 25. The results were at their lowest with only 2% of participants scoring at the genius level. George Land’s 2011 TedX Talk offers some ideas about the cause of this creativity decline and suggests that the only way humanity can create a new future, and solve new problems that we’ve never seen before, is to reclaim the 5-year-old. This way, we can move away from stress and fear and enable imaginative and creative thinking, thus becoming great innovators. In the last 30 years, technological advances have rapidly re-shaped how we do business. Entrepreneurs recognising the crucial role creativity plays in an ever-changing marketplace are finding success. An IBM survey of more than 1,500 Chief Executive Officers from 60 countries and 33 industries worldwide reports that creativity is the single most important ‘leadership competency’ for enterprises facing the complexity of global commerce today. The employment of creative thinking is the key driver of innovation, demonstrated by companies such as Google, Virgin, Tesla and Patagonia – all employing creative business strategies. Google’s creative workplaces set a precedent in business operations. Through research, they’ve discovered creativity results in massive boosts in employee retention, wellbeing and productivity, leading to insanely successful products, branding and profit. Not bad for a company that began in 1996 as a research project! Tesla Motors also engages in out of the box business strategies shaking up the automobile market. It is the first motor company collecting deposits for vehicles yet to be released. Its unique business model enables billions in assets to be delivered directly towards product development and innovation without excess funds allocated to advertising (currently unseen in the industry). These strategies draw exponential support from consumers and are changing the platform of motor sales. Tesla is also expanding further into the energy market. A 2014 report by Adobe and Forrester found 82% of companies believe there is a strong connection between creativity and business results. Companies actively fostering creative thinking outperform their rivals in revenue growth, market share and competitive leadership, according to the report. A 2016 report by Adobe found ’being creative helps make people better workers (70%), leaders (70%), parents (69%) and students (69%). Jhana is a published author, illustrator, public speaker and creativity expert. His artworks are collected globally and is represented by Art Obsessions Gallery in USA. His articles on creativity and empowered living have been published in magazines including the Art of Healing, Living Now, and dozens of newspapers in Australia and USA.